For a wine buff, it was an evening of almost silly delight: A tasting of wine after great wine from the astonishing portfolio of Italian producer Marchesi Antinori, an array that extended from Brunello di Montalcino to Super Tuscans the likes of Guado al Tasso, Tignanello and Solaia. Led by Patrizia Demonte, Antinori’s business development manager for the Midwest, the recent Chicago tasting offered an impressive reminder of the company’s lofty place in the hierarchy of world wines and just why Antinori’s name is associated with the benchmark of quality. It was an occasion of much buzz and head-nodding among the participants. The only dispute concerned which of these stellar wines was a personal favorite. Even that issue carried some amusement: As the wines were presented, each new offering seemed to take its place at – or at least near — the top of the list. For my part, I kept coming back to Antinori’s 2009 Brunello di Montalcino Pian delle Vigne, a ruby-hued wine of consummate finesse but also plush and richly layered with flavors of dark fruit and chocolate with hints of leather and tobacco. It is 100 percent Sangiovese. A fine acid frame and ripe tannins contribute to this Brunello’s complexity and vibrance. Though it’s drinking surprisingly well now, the 2009 Pian delle Vigne ($56) – named for a 19th-century train station located on the estate property – clearly has the potential for 15 or 20 years of aging. I can imagine sampling one bottle from a case every two years just to relish changes in the wine through its arc of maturation. Two strikingly different Super Tuscans were presented as a pair, the 2010 Guado al Tasso and the 2011 Tignanello. 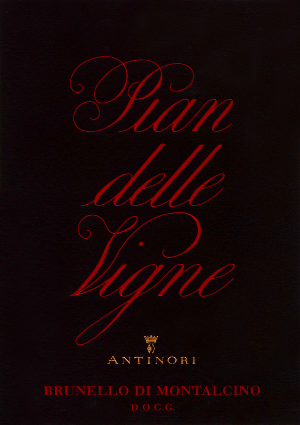 The term Super Tuscan harkens back half a century to a time when Antinori made the radical decision to blend Cabernet Sauvignon into Tignanello’s base of Sangiovese. Back then, Tignanello was simply Chianti. But there was no provision under Italian law for such a blending, and so Antinori labeled his new hybrid as mere vino da tavola – table wine. 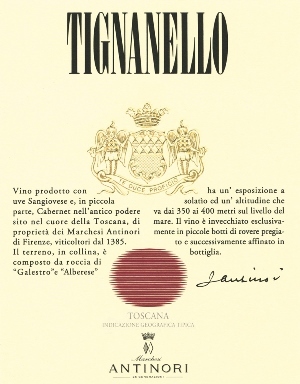 Thus Tignanello became the first example of a new category of blends that would come to be known – and soon highly prized — as Super Tuscans. The 2011 Tignanello ($87) is a beauty, blended from 80 percent Sangiovese with 15 percent Cabernet Sauvignon and 5 percent Cabernet Franc. The wine’s red-plum color offers an unexpected contrast to flavors of dark plum swirled with black currant, cedar and a touch of anise. This Tignanello fills the mouth generously and its finish is long. Guado al Tasso takes the Super Tuscan concept to the extreme: None of its component grapes is indigenous to Italy! The 2010 Guado al Tasso ($96) presents a Bordeaux blend of 55 percent Cabernet Sauvignon, 30 percent Merlot and 15 percent Cabernet Franc. The wine is quite dark, almost black, its textures luscious and dominated by blackberry, tobacco, leather and dried leaves. It’s as imposing as it is majestic; indeed, this Guado al Tasso shares with the Tignanello and the Solaia an alcoholic factor of at least 14 percent. The name Guado al Tasso, by the way, means “badger’s ford” – after the frequent sightings of badgers at the estate where the wine is made. Somehow it’s more fetching in Italian. 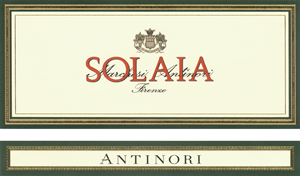 Antinori’s 2011 Solaia (the name means “sunny one”) was served last for a reason. This blend of 75 percent Cabernet Sauvignon, 20 percent Sangiovese and 5 percent Cabernet Franc is spectacular: deep red, with a floral nose accented by ginger and a hedonistic richness on the palate that’s ruled by dark fruit and bitter chocolate. To taste this wine at the end of a sequence is to feel like you’ve just shifted into warp speed and burst into another galaxy. It’s a keeper, to be sure, provided you’re willing wait. Though it really needs some cellar time for its ample tannins to mellow, the 2011 Solaia ($220) possesses both ample fruit for the duration and a solid acid structure to keep it together. This is, by any measurement, un grande vino.